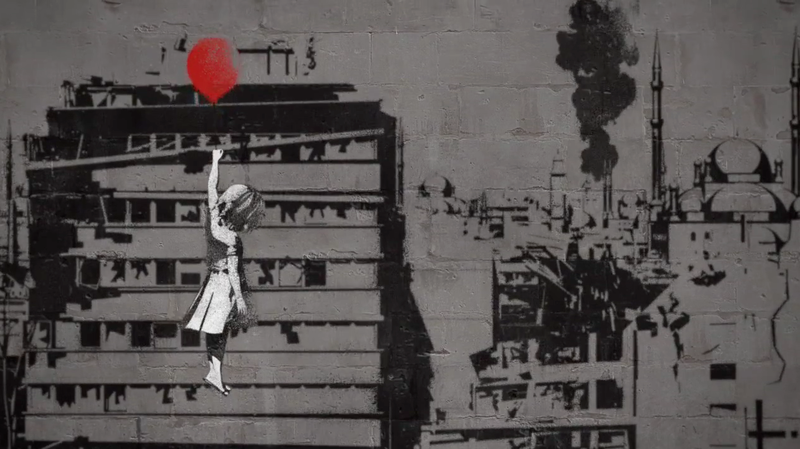 Banksy's "Balloon Girl" provides a fitting image for the children whose lives have been ravaged by Syria's civil war, which just entered its third year. The British street artist drew some criticism in October for the "awkward politics" of his satirical video about the conflict. His balloon imagery in this new "With Syria" awareness campaign, however, based on his stencil from 2002, has met with considerable praise, and rightly so. "With Syria" is no less powerful, and its duality is striking, encompassing both hope and regret. The hopeful message of kids lifted above violence and strife toward a better future (represented with soul and simplicity in the "With Syria" video) has received the most attention. The regretful message is subtler. A child clutching for a balloon suggests a childhood lost. Forever. That fate has befallen far too many Syrian kids already. More will suffer if we don't rise to the challenge and bring about meaningful change. The animated spot was written and created by Sunshine, and directed and produced by RSA Films. Idris Elba does the voiceover. Elbow contributed exclusive music.